newsXpress yesterday launched a competition on Facebook giving away a copy of the Kylie Jenner issue of Vogue Australia. This is one of ten copies of the magazine being given away by newsXpress through a series of opportunities. There s a newsagent today claiming they have the last copy in Australia, which they are giving away. They don’t. newsXpress certainly does not claim that. 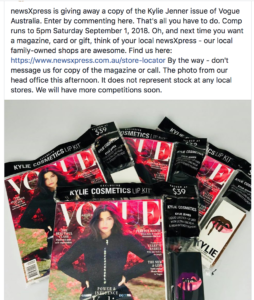 While this issue of Vogue has been terrific, I would not stock the reprint given that, as I understand it, it will not have the Kylie Jenner gift. The newsXpress post I did last night has reached 39,499 people without anything being spent boosting it. It has resulted in plenty of questions about other products newsXpress stocks, beyond this issue of Vogue.